Politics are a survival tool–especially for people experiencing discrimination. It’s how they fight back against exclusion. Specifically, it’s how they learn to advocate for better laws that protect their human rights. It’s how they teach political leaders to be inclusive of deaf people. 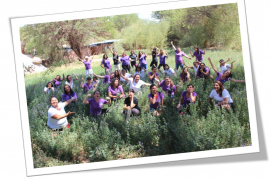 Mill Neck International (MNI) is supporting five Deaf organizations around the world in implementing various projects. These projects include training Deaf leaders, gathering data about Deaf people, and more. MNI provides funding support and training for members of local project teams. 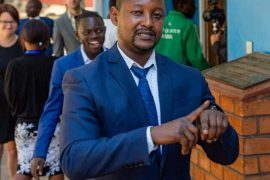 In Tanzania, this means training more Deaf people to become involved with local politics. In the United Republic of Tanzania, a country on the east coast of Africa, MNI’s project partner is Chama Cha Viziwi Tanzania (CHAVITA). The name, Chama Cha Viziwi Tanzania, means Tanzania Association of the Deaf in the Swahili language. Tanzania has ratified the Convention on the Rights of Persons with Disabilities (CRPD). The CRPD is the first legally binding human rights treaty to address people with disabilities. Tanzania has passed laws that protect the rights of people with disabilities. But Tanzania often does not enforce these laws. This is similar to many other countries. CHAVITA’s project addresses this problem. CHAVITA is training 30 Deaf people how to use local and international disability rights legislation in advocacy. The project also works with municipal and local officials. It educates them about Deaf rights. CHAVITA is teaching officials how to make their plans inclusive of Deaf people. The goal of their project is to enable Deaf people to be knowledgeable about legislation. Thus, they can keep local government accountable. The project focuses on Deaf people in Arusha Urban, which is a district in the northern part of Tanzania. 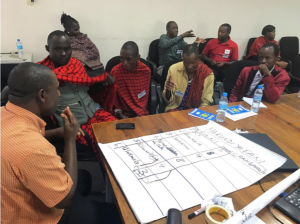 In October 2018, MNI sent Planning, Monitoring & Evaluation Specialist, Sarah Houge, to Arusha, Tanzania. She attended and observed CHAVITA’s first training session with the local Deaf community in Arusha. 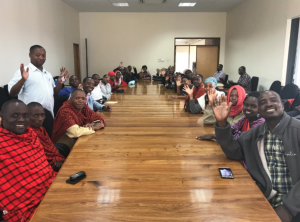 Thirty Deaf people participated in the three-day workshop., including several Maasai people. Maasai are an underserved ethnic group who reside in parts of Tanzania and Kenya. CHAVITA hopes participants will use their knowledge to advocate with local government for their rights. Sarah Houge also participated in information sharing and planning meetings with the CHAVITA project team and local community groups. She met CHAVITA staff and members to learn more about their other projects around the country. 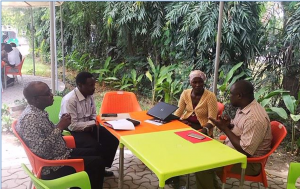 Their work has involved partnerships and collaboration with other disability organizations and local government agencies in Dar es Salaam and elsewhere. She also provided training on the Convention on the Rights of Persons with Disabilities (CRPD). This included explaining CRPD articles that mention sign language and other Deaf rights. She visited the Meru Primary School, which has a Deaf Unit of 60 students. The principal of the Unit is himself Deaf. He was proud to explain that all the students have passed their annual exams. He says this is because all the staff in the Deaf Unit are fluent in sign language. Next, CHAVITA will provide training to government and municipal officials in January 2019. Please follow MNI via our Facebook page to learn about CHAVITA and other partner organization activities!